When Betty says, "HOB, take me away!" Smart HOB simply responds, "How far?" This past weekend Betty had to get out of town, blow the pop stand, shed her domestic garb and don the togs of a freewheeling vagabond. 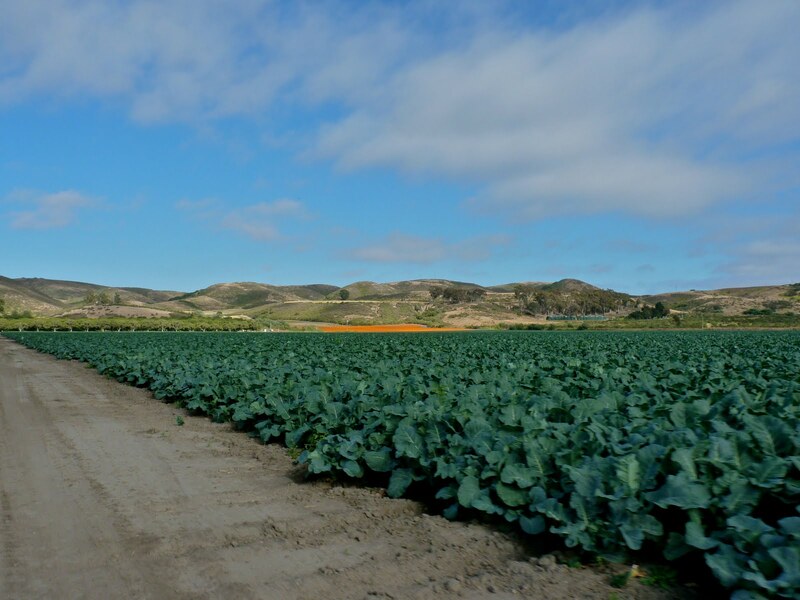 We made a little trip up to the Solvang area to do a little hiking and sightseeing. We had a fine time traveling along, singing those classic hits of the 70's. 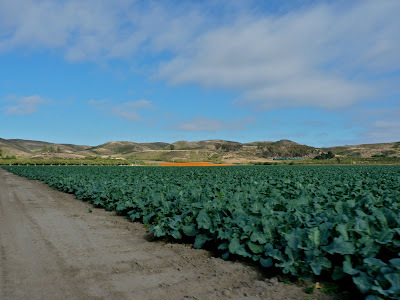 Suddenly, we saw fields like the one behind this broccoli field. We were smack dab in the middle of marigold country! 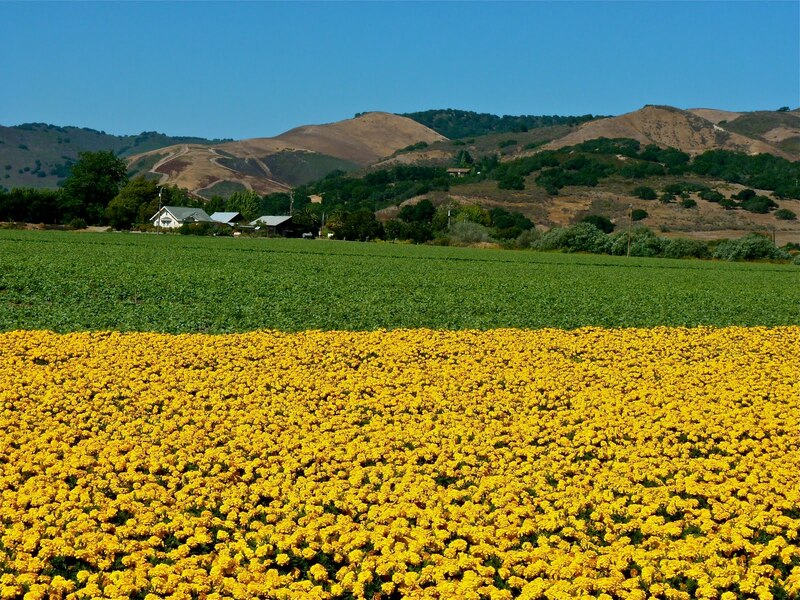 Betty's head snapped back and forth from the yellow fields to the orange fields. We may have even traveled on some private property to get some of these shots. Who could blame us, really? It was a real thrill to see these fields! Betty got her traveling ya-ya's AND photography ya-ya's out. These pictures are all so beautiful. I'm glad you trespassed. That way, we got to see these shots. I was too busy looking at the Evil Broccoli in the first picture. 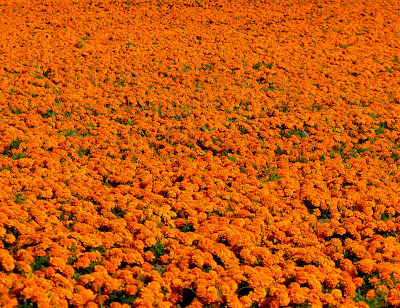 BB Oh my word...I've never seen that many beautiful marigolds as one time. I especially love the hills in the background. Gorgeous countryside we thank you for taking a chance at being on private property to get such lovely shots. Beautiful photos..Can't take my eyes off of them. Great work. Oh wow! 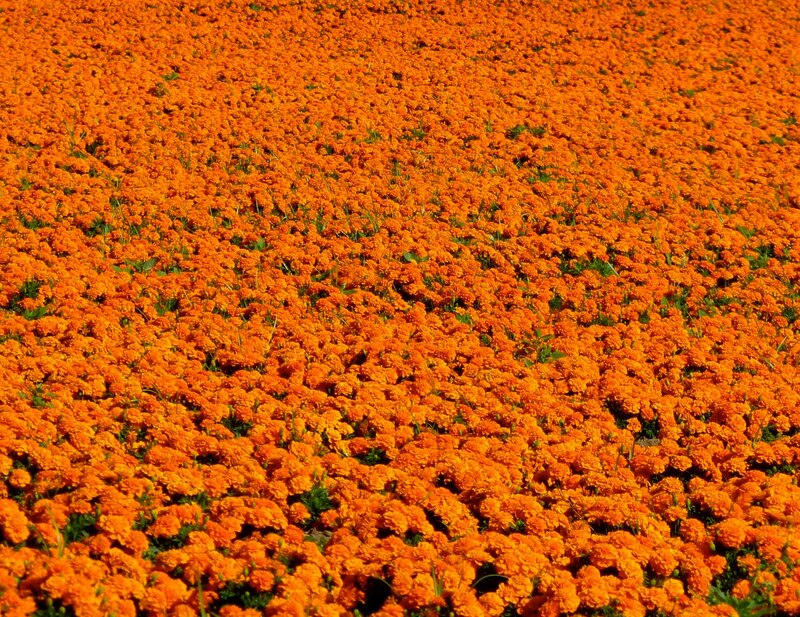 All those marigolds are gorgeous! Wowza! Did the air smell all marigoldy? Those are stunning photos! And I love a guy that will take you wherever you want to go. Wow, that looks beautiful! Isn't Solvang famous for some kind of Christmas shop or festival or something? Those pictures are great! 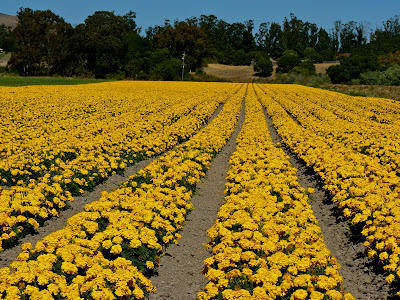 I've been to tulip fields like that, but never marigolds. So beautiful! Oh that looks beautiful. I'll bet they smelled amazing. Great shots! Been to Solvang a couple of times. Lovely town. Did you take pictures of those houses in town? Egads! Did you find heaven on earth?! Where's the field of parsley? What beautiful pictures! How's the whiplash? Love your blog! Thank you so much for the kind words you left at my place. Sometimes you have to break a few laws to get your ya-yas!! Stunning pictures. I wished sometimes that I still lived in California. Betty, what does one do with that many marigolds??? 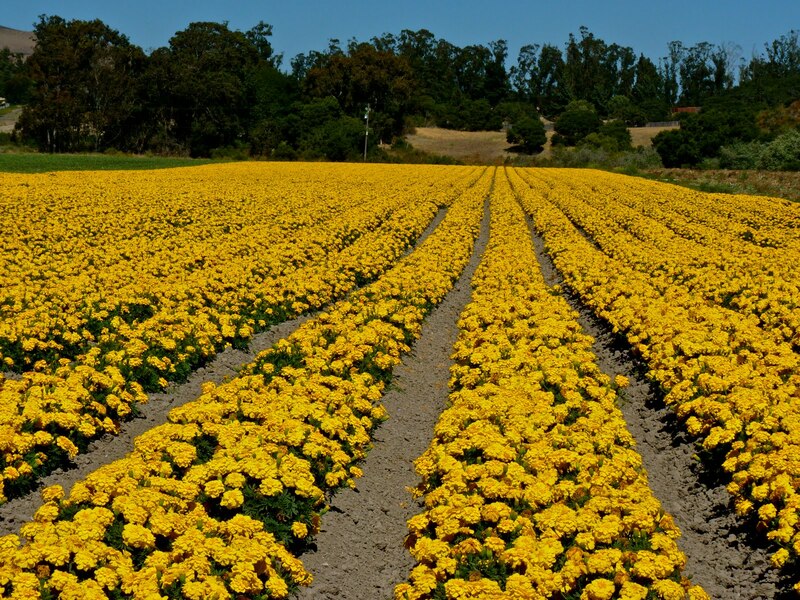 What beautiful photos of marigolds. And I love them. The first flower I grew in Texas that didn't die on me. Oh my! What an enchanting vision to come upon. Gorgeous!!! When I read you were headed toward Solvang, my first thought was, "But you're not *old enough* to enjoy Solvang! We stopped there on the way home from San Luis Obispo once... gah! Old person heaven here on earth! thanks for your lovely comment on my blog!!! I am like you betty in that I like to make Tim take me on little adventures. I love your photos. Have you gone down to Laguna to the Sawdust festival? We went last weekend and it was so much fun. Just a little reprieve from the daily grind...it felt like a mini vacation...even if it was only for an afternoon!! Wow. I want to go on this trip, leave the reading behind and fall asleep. WHOA!!! What a site. All that color, those are some mighty pretty fields. What a blessing to find those fields of loveliness! WOW! WOW! WOW! WOW! :-D Love it! 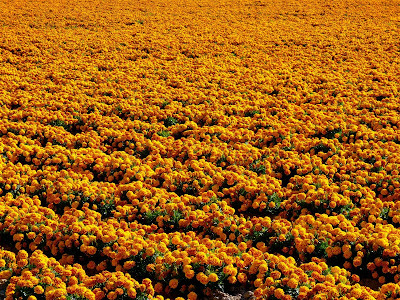 Flowers as far as the eye can see. How great is that! Simply gorgeous!! Thanks for sharing these with us! Majestic comes to mind or amber waves of something. WOW!!! AHhh Solvang is so beautiful! I have only been there once. I really should go back. Love your pictures. Oh, how fabulous!!! What a beautiful thing to discover. Great photos, too. Wow!!! Now why can't I discover something amazingly beautiful like that?!! All I get around here is corn, and more corn...and more corn. Holy colors bat man, I have envy pains. Beautiful photos. My parents live behind a major huge blueberry farm and I love to go walking on the farm and have nice snack next time I'll take some photos. esp those such orange's carpet.. I love it!! thanks for showing those beautiful pics. Sometimes it just pays to be a scofflaw! Just beautiful! 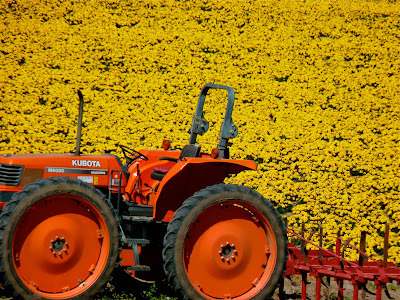 I especially like the orange tractor among the yellow flowers! did they paint the tractor to match the fields? really beautiful! so glad you got the shot without getting shot! So pretty!! I know you were excited! Awww, Love those pics! Very beautiful! Especially #1 , #2! Great angle!! Gorgeousness. Nothing like an unexpected road trip. I've come to think it is a requirement for a happy union---the longing to hit the road together. Next time you come up to my neck of the woods, let me know! I'd love to meet you for coffee or an aebleskiver or something appropriately local. For future reference, my neck of the woods includes anyplace from Gaviota to the Santa Ynez Valley.